UNPO: Tibet: Water Grabbing and Security: Where is Environmental Justice? Tibet: Water Grabbing and Security: Where is Environmental Justice? Photo courtesy of: Business Insider. The Chinese government continues to flood Tibet with potential mega development projects. China now plans to build the world’s largest water tunnel in the province of Xinjiang, stretching the Yarlung Tsangpo River to the barren Xinjiang region, thereby depleting the Tibetan Plateau waters. Specialists warn of the disastrous impacts this project could have, as for example mass migration and environmental catastrophes. Chinese natural resources exploitation policies already participate to the disruption of life-sustaining rivers of the Tibetan plateau and the construction of dams force thousands of families to leave their homes. This article was published by Fortune. Engineers in China are laying plans for what would be the world’s largest water tunnel at more than 600 miles. The tunnel, which would stretch from Tibet to the Taklimakan Desert in Xinjiang province, would surpass the current record holder: an 85-mile tunnel that pipes water around New York City. 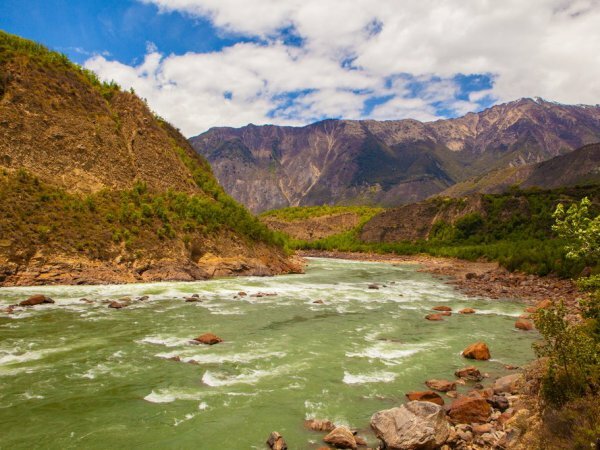 The planned 621-mile tunnel (1,000 km), would transport water from the Yarlung Tsangpo River to the barren Xinjiang region, with the goal of turning the area “into California,” an anonymous geotechnical engineer told the South China Morning Post. There are major obstacles to this ambitious project, including objections by neighbouring countries. The Yarlung Tsangpo River crosses the border with India to become the Brahmaputra River and later merges with the Ganges River in Bangladesh. Other potential roadblocks include the rugged terrain the tunnel must go under and environmental concerns. “The more than 400 billion tonnes of water [the Tibetan Plateau] releases each year—almost enough to fill Lake Erie in the United States—also feeds the source of other major rivers, including the Yellow, Yangtze, Mekong (known in China as the Lancang) and the Ganges,” The South China Morning Post reports. Zhang Chuanqing, a researcher with the Chinese Academy of Sciences’ Institute of Rock and Soil Mechanics, said the project won’t start for another 10 years because of the cost and technology. In the meantime, Zhang points to the 373-mile tunnel being built in the Yunnan province (on which construction started in August) as a test run for the longer Tibetan project. The Yunnan tunnel begins on the Yunnan-Guizhou Plateau, the second-highest plateau in the country after Tibet, making it a good model for its longer cousin, according to Zhang. The Yunnan tunnel will be a big challenge because of its size—it will be wide enough to fit two high-speed trains—and the fact that it must cross earthquake fault lines. Along with climate change, earthquakes are a concern for environmentalists when it comes to the Tibet-Xinjiang tunnel and the possibility that a temblor could cause a failure in the tunnel and create a flood. “The region is also earthquake-prone and it could lead to a huge natural disaster,” Lobsang Yangtso, from the non-profit International Tibet Network told Quartz. Currently, the longest water tunnel in China is the Dahuofang Water Tunnel, which stretches 53 miles through the Liaoning province, located in the northeast of the country.